You can easily save any of these instructions to your computer for viewing while off-line. On a PC use the ctrl key + s then choose to save as type "web page html only" Or do a file "save as" from the drop down menu on your browser. Direct it to save the instructions in the folder of your choice. Direct links to the instructions for the various kits are listed on the right hand side of the page. Folding small pieces is easy with a little bit of help from your tools. 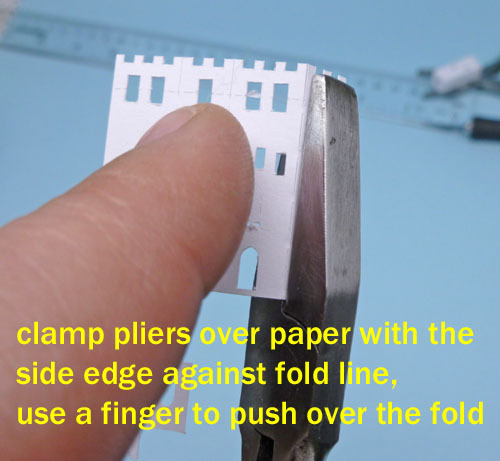 If you bend against a straight edge of some type it is easy to fold accurately but the straight edge tweezers are much easier to use on micro sized buildings than using a straight edge. This is very important to know. Tiny delicate details should be supported by clamping over them with tweezers or pliers if those pieces are right next to a fold. That will often be needed where there is a door or window very close to a fold line, especially on the Micro scales buildings that are made from thin cardstock. Bending longer pieces with flat jawed pliers clamped next to the perforated bend line. You can also use the straight across tip for folding shorter pieces or reaching across longer sections to get to a fold line. I always have my craft knife out when I am putting the kits together. It is my number one, quick bending aid for folding small parts that are not too small or delicate. Yes I do use the sharp edge right by the perforated line but as it is being held still there is no danger of cutting the paper or myself. I also always have on hand a pair of flat nosed, good quality, eyebrow tweezers. 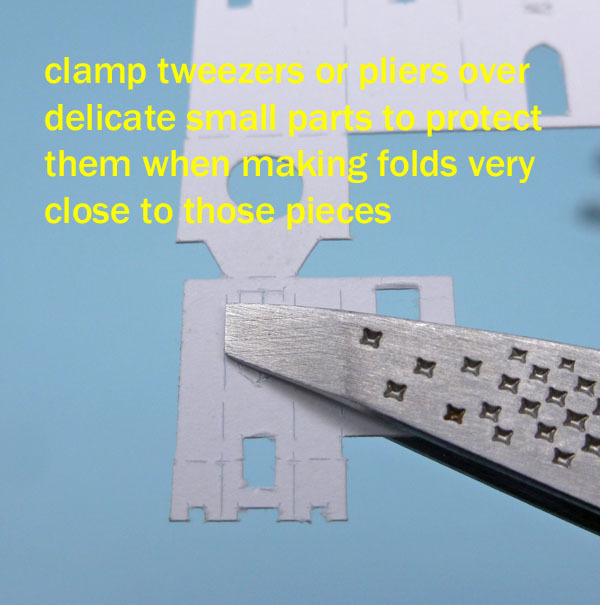 When I am folding next to an area such as a door or window that is very close to a fold line I clamp over that delicate area to stabilize it putting the tweezers tip against the perforated fold line. Then push on the stronger area on the other side of the bend line to make the fold. Now here is a very delicate area to fold, a double door to open right next to another bend line for the sides of the building. 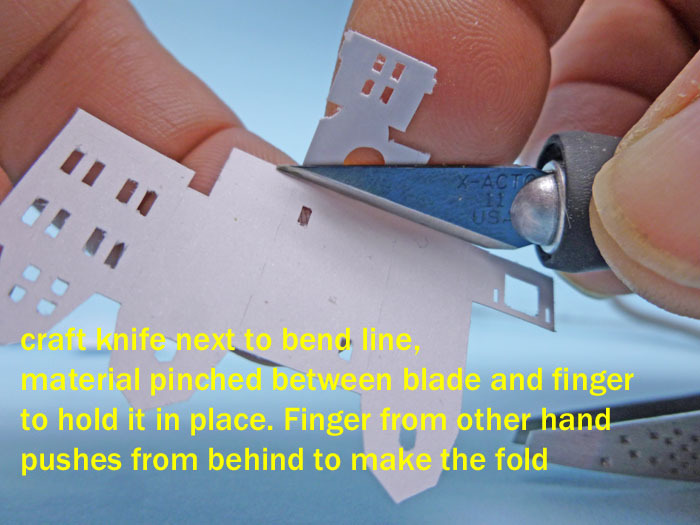 The tweezers are used to clamp over the building side fold line and also go up against door's hinge fold at their tip. 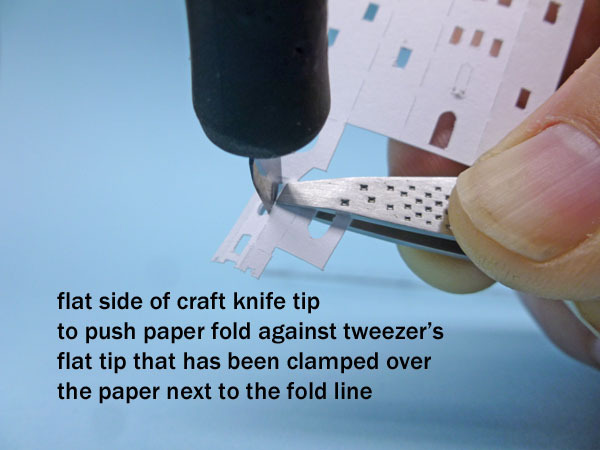 Then I slide my craft knife in the cut opening of the door and used the flat of the knife blade to push the door open against the flat of the tweezers tip. This way there is no deformation of the cardstock parts as everything is well supported. All copyrights for content of this blog belong to Karin Corbin.. Simple theme. Powered by Blogger.